This tutorial shows an example using Houdini to modify the transform of model in a USD scene. The files for this tutorial live in USD/extras/usd/tutorials/Houdini. It is assumed that you have a working knowledge of Houdini. 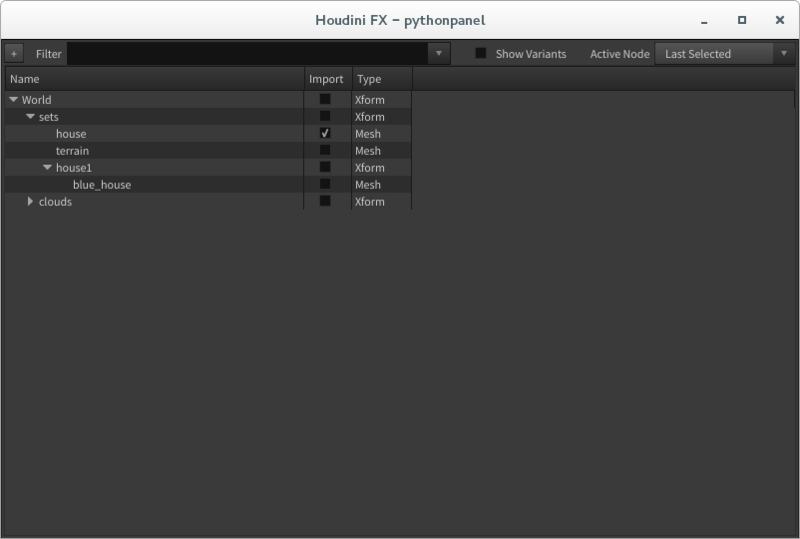 use usdview to determine what you need to import into Houdini. import all the geometry to modify and anything needed for reference into Houdini. modifying the imported models position, orientation et al. Export the chages to a USD Overlay. Insert the Overlay back into the USD Scene. Open the USD scene in usdview to identify the geometry you want to modify by using the following command line. First select the prim by clicking in the prim browser on the 'house' row. Next hit 'f' to bring it into frame. Note that the house appears yellow because we have selected it. You can find the name of the prim path of the house in this USD stage(/World/sets/house) by looking at the Prim Name window in the upper left hand corner of usdview. You'll use this information later when we import the house into Houdini. Imagine that you have received a note that the house should be placed at the top of the highest hill on the terrain. It's time to import the little red house into Houdini. 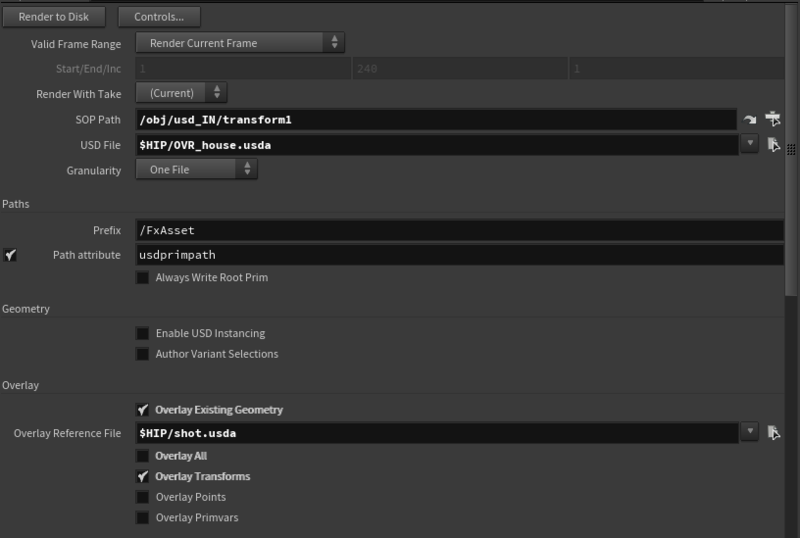 From the Geometry context in Houdini drop down a USD import SOP. Enter the name of, or browse to the USD file that contains the stage you’re interested in modifying in the "USD File" parameter. enter the name of USD Prim path you are interested in modifying into the "Prim Path" parameter. you can also use the Tree view to visually browse through the USD stage to select the prim path. 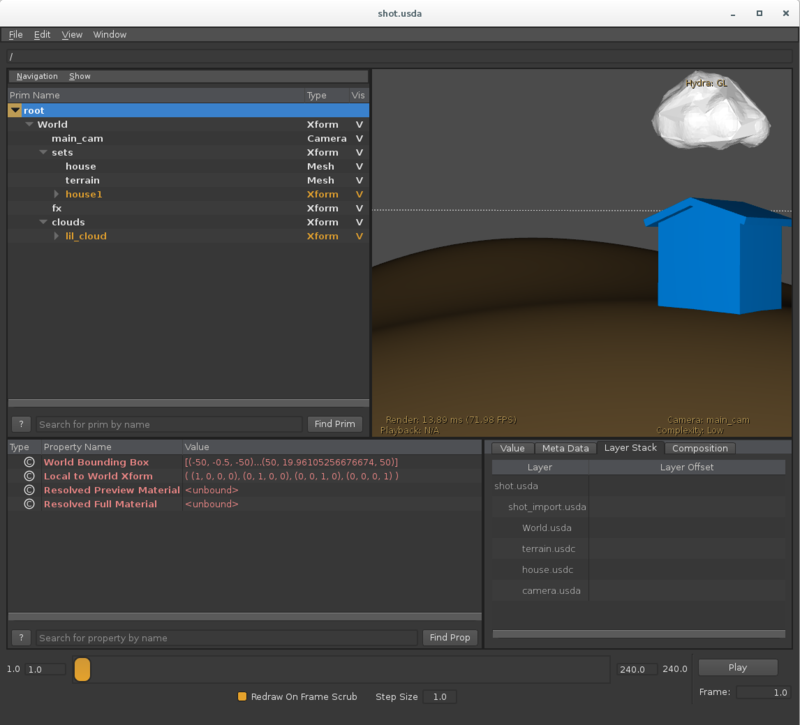 You should now see the little red house in your Houdini viewport. On middle mouse click of the usdimport SOP you will notice that there is one primitive, a packed USD. As you will only be altering the transformation of this model you can keep it packed and export what is known as a transform overlay. Import the terrain for visual reference. Repeat the steps above to import the terrain model by duplicating the usdimport SOP and replacing the "Prim Path" with /World/sets/terrain and templating the new usdimport SOP. Use the transform sop to move the house to the top of the highest hill. 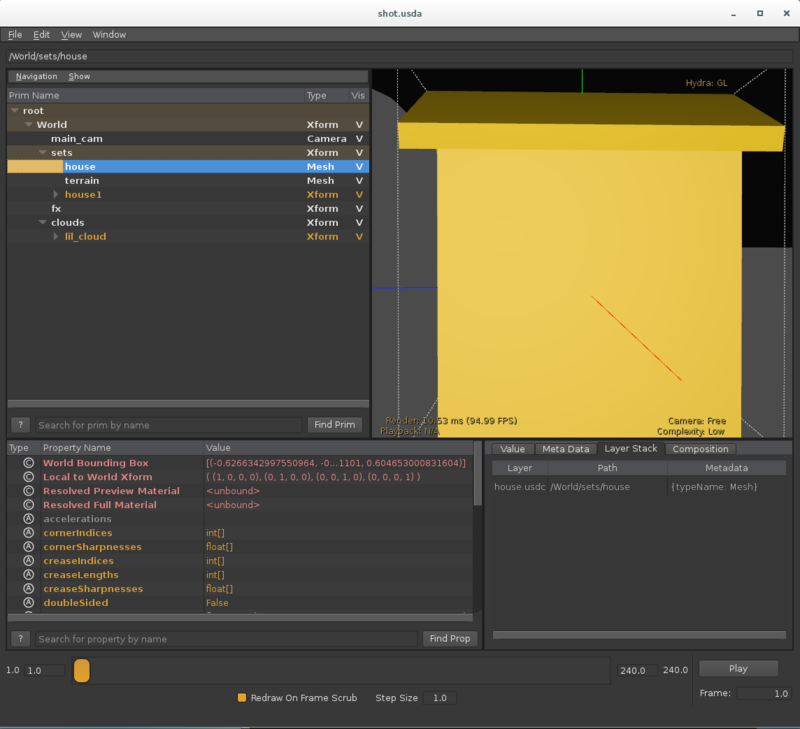 Create a "USD Output" ROP in the Outputs context of Houdini. Enter the path to the transform sop you used to move the little red house. Toggle the "Overlay Existing Geometry" Parameter on. Enter the path of the new USD file that will contain the overlay. Enter the file path of the USD file that contains the USD prim you wish to override into the "Overlay Reference File" parameter. As you are only interested in altering the transform of our model we are going to uncheck "Overlay All" and check "Overlay Transforms"
Drop down a "USD Layer" ROP into the Outputs context of Houdini.